Blog Home > Technical Documentation > Tech Docs: The May Release of AutoFocus is Now Live! This release of AutoFocus introduces a number of usability improvements related to the AutoFocus user-interface, as well as support for samples submitted through Magnifier and Traps Android. New Upload Sources: AutoFocus now processes sample data that’s been submitted for WildFire analysis from Magnifier and Traps Android. 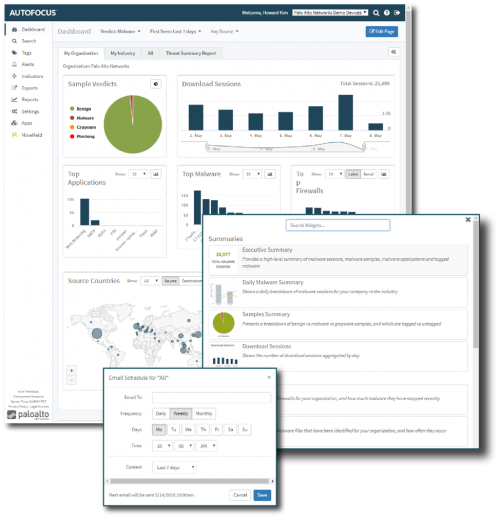 Widgets and More Widgets: You now get two new map-based widgets to help you visualize threat sources and destinations along with three streamlined tagtype-displaying widgets. You can also now use Threat Summary Report specific widgets in any of your reports. For select widgets, you can specify the number of ranked items displayed in a graph. The Download Sessions widget used in the dashboard and reports now displays the total session count. Faster and Easier Searches: You can now search for AutoFocus artifacts using the new simple search option. This allows you to quickly initiate searches based on frequently-used search variables. Scheduled Reporting: You can now configure AutoFocus to automatically generate and send reports to email addresses based on a specified time interval and date. Dashboard and Report Filters: You can now filter the data being displayed on dashboard and report pages using the quick filters located at the top of the page. For more details about these enhancements and other new features, take a look at the AutoFocus New Feature Guide. AutoFocus Release Notes—Lists what’s new in the release, known issues, and the issues we’ve fixed. AutoFocus New Feature Guide—Provides a snapshot of the new features the releases introduce, so that you can get started with each feature quickly. AutoFocus Administrator’s Guide—Takes you through the configuration and maintenance processes of AutoFocus.